A traditional wood fence continues to be a great option for homeowners. Are you considering investing in a fence for your property? They are a great addition to any yard because they can provide a homeowner with a tremendous amount of privacy, security, and curb appeal. Did you know that there are many styles of fences available today? Each of which has their pros and cons. However, many argue that a traditional wood fence is the way to go! 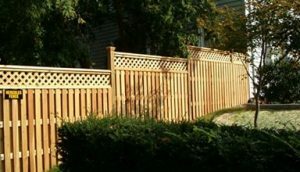 If you envision a new fence in your yard’s future, here are a few benefits of choosing standard wood fence! Wood fences are easy and straightforward to install. When you compare it to other styles of fences, they are a total breeze. It is heavily dependent on the size of your property, but an average length wood fence usually takes a few days to install. Metal fences, on the other hand, tend to take much longer. If you want a fence for your property but you do not want to break the bank, a wood fence is an excellent option for you! Wood is a cost-effective material. It also looks nice and can quickly be transformed with a fresh coat of paint or stain! Wood is one of the easiest materials to work with! In most cases, a wood fence is easy to paint or stain. If one day you decide you no longer like the color of your fence, you can easily paint over the existing color to transform your wood fence! On average, a wood fence lasts about twenty years. Wood is a durable material, which makes it perfect for fences. If you want to prolong the life of your wood fence, there are products available to help with just that. Even just a fresh coat of paint can go a long way in terms of preserving your fence! This entry was posted on Friday, October 20th, 2017 at 3:53 pm. Both comments and pings are currently closed.